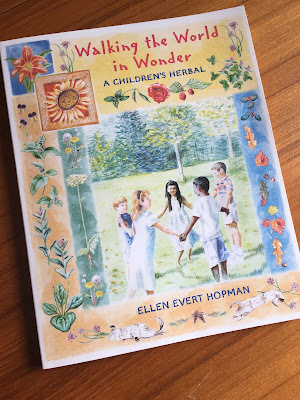 It's not exactly a new children's book, but Walking the World in Wonder, A Children's Herbal by Ellen Evert Hopman has to be one of the most beautiful and informative introductions to the natural world of herbs for kids that I've come across in a long time. The book begins by introducing us to The Wheel of the Year, and explains how different holidays and festivals that mark the changes in the sacred earth year. It describes different plants and flowers according to the seasons and also includes activities kids can engage in for each of the flowers and plants featured. This excerpt from Hopman's book describes the magic and majesty of sunflowers perfectly. "I am the mighty sunflower. I have BIG flowers that bloom from summer to fall--a round brown center with golden petals that remind you of the sun. I can grow up to 12 feet tall! My leaves are rough and my stems are hairy. You can find me in fields and prairies and sunny gardens. I am a native plant to Mexico and Peru where I was once considered sacred by the Aztecs and worshiped by the Incas. Priestesses would carry my flowers in the temples of the sun and wear crowns of them in their hair. I was honored so highly that sculptures of my flowers were made out of pure gold and paced in Aztec Shrines. 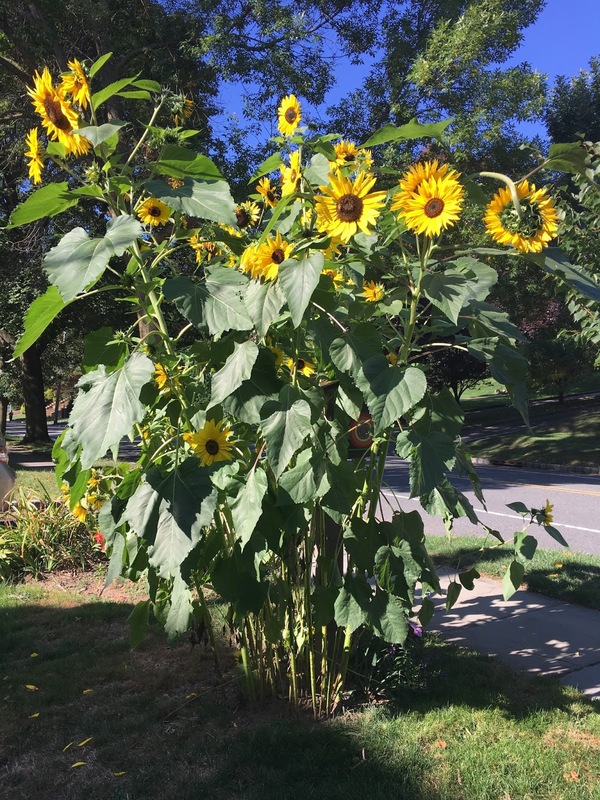 After a long summer my sunflowers are finally in full bloom, boldly towering over everything else in the front yard. It's nice to watch the smiles on people's faces as they walk by. Walking in the World of Wonder, A Children's Herbal is available through Amazon. I found the book however, in the wonderful metaphysical shop Crystal Essence and Wellness Center which is located in Great Barrington in The Berkshires. Hopman periodically lectures at the store. I hope to catch one of her talks sometime in the future!